The College of Engineering's history has been richly interspersed with innovative and inspirational students, faculty and staff where women and minorities leap over social obstacles and strong leaders continue to guide the pack. NC State University's School of Engineering operated the world’s first nuclear reactor used for teaching, research and public service. Burlington laboratory was built to house R-1, a 10-kilowatt reactor that has been upgraded numerous times since. The nuclear reactor program was also the first research reactor in the US to go international. After years of debate, legislation was passed establishing the “North Carolina College of Agriculture and Mechanic Arts” (N.C. Senate 29-13). Engineering departments were established. Dr. Wallace Carl Riddick Jr. joined the faculty of the North Carolina College of Agriculture and Mechanic Arts as professor of mechanics and applied mathematics at a salary of $1,500 per year. He was ecstatic. He wrote in a letter to his sweetheart, “Come on and marry me, Lilly. They’re paying me so much money I’ll never spend it all.” And she did. The first graduating class at N.C. State was in 1893 with 19 graduates: 14 completed the course work in “mechanics” (“mechanic arts” or “engineering”) to receive the BE degree (Bachelor of Engineering), and the remaining 5 received degrees in agriculture. Wallace Carl Riddick was the College’s first professor of civil engineering. He became head of the Department of Civil Engineering and served until 1908. The North Carolina Society of Engineers was organized with charter member Wallace Carl Riddick serving as one of the key organizers. He served as the society’s second president and for three consecutive terms. Eugene Clyde Brooks became President of NC State. The School of Engineering was formed, and Riddick was named the first dean (Wallace C. Riddick, Jr., dean from 1923-1937), following his expressed desire to take on this role. The School consisted of the Electrical Engineering Department, Civil Engineering Department, Physics Department, Textile Engineering, and Mechanical Engineering. The “Engineering Experiment Station” was established by NC State’s Board of Trustees. School of Engineering enrollment (undergraduate and graduate combined) was 685. The Industrial Engineering department was established. The first record of I.E. as a curriculum at NC State appears in the spring 1930 college catalog. The first IE degrees were granted to Henry K. Saunders and Harold E. Thomason. Col. John W. Harrelson became President of NC State, but he choose the title “Dean of Administration” instead of President. The title was later changed to Chancellor. Wallace Carl Riddick, Jr. retired as Dean of Engineering after 14 years of service. Dean Blake Ragsdale Van Leer became dean. He served until 1942, when he left on military leave. During Van Leer’s tenure, he established a service division in Diesel and Internal Combustion Engineering. First accreditation of engineering curricula: ceramic, civil, electrical, mechanical. First honorary engineering degree was given at NC State: Arthur Ernest Morgan, Doctor of Engineering. The Department of Aeronautical Engineering was established. School of Engineering enrollment (undergraduate and graduate combined) was 1,180. Wallace Carl Riddick received the Award for Outstanding Achievement from the North Carolina Society of Engineers in recognition of 50 years of “most commendable service” to the State of North Carolina. One of the most significant contributions to the war effort is the Diesel Program, developed by the Mechanical Engineering Department to train naval officers. Blake Ragsdale Van Leer resigned his position as Dean of Engineering for military leave. L.L. Vaughan was named Acting Dean (“acting” was the term for “interim” at that time). He served 3 years. During Vaughan’s term (1) Army Special Team Program was conducted at Engineering School (one of four ASTP Centers in US to have an advanced engineering program); (2) NC State became the only engineering school in the South to conduct the Pratt-Whitney Fellows Program to train women as engineering aides; (3) US Bureau of Mines Laboratory was established in the School of Engineering (building transferred to NCSU in 1957); (4) groundwork was laid for establishment of a minerals research laboratory in western part of the state. L.L. Vaughan stepped down as Dean of Engineering. J. Harold Lampe became Dean and went on to serve 17 years, the longest tenure of any Dean of Engineering at NC State. During Lampe’s years of service (1) among curricula developed to serve special industrial needs were furniture manufacturing and management, construction, heating and air conditioning, and nuclear engineering (aeronautical engineering became an option in the Mechanical Engineering department); (2) department of Engineering Research, Industrial Extension Service, Department of Mineral Industries, Department of Nuclear Engineering, and Engineering Placement Office were established; and (3) three major buildings are constructed: Riddick Engineering Laboratories, Broughton Hall, and Burlington Nuclear Engineering Laboratories. The Engineering Experiment Station was renamed “Department of Engineering Research” by action of the Board of Trustees. As part of the School of Engineering, the “State College Minerals Research Laboratory” (now called the Minerals Research Laboratory) began formal operations in Asheville. Ralph E. Fadum became head of Civil Engineering. Dr. Clifford K. Beck began his term as Physics Department Head. During his tenure (1) Daniels Hall space was renovated for physics, (2) approval to proceed with reactor design was secured from the AEC, (3) appropriation of $50,000 was granted by the 1949 General Assembly, (4) a curriculum in nuclear engineering, with full undergraduate, “fifth-year,” and master’s programs, were devised and approved. The newly organized nuclear engineering curriculum was placed into operation, and the first courses in nuclear engineering were given. Plans for construction of a building to house the 10-kW nuclear reactor on the campus of NC State College were completed, and construction of the reactor and laboratory building was begun. The Burlington Mills Textile Foundation contributed $200,000 for the project. Riddick Engineering Laboratories building was named in memory of Dr. Wallace Carl Riddick. Frances M. “Billie” Richardson became the first woman faculty member in the School of Engineering at NC State. The Advisory Council of the School of Engineering was formed, comprising a 15-member group of leaders from the State’s industrial, professional, and community life. Carey H. Bostian became President/Chancellor of NC State. First Ph.D in engineering was awarded to Ralph Marshall McGehee. 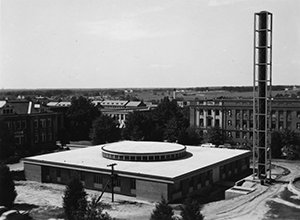 NC State’s School of Engineering today operated the world’s first nuclear reactor used for teaching, research and public service (first non-government nuclear reactor). One year later, NC State launched the nation’s only doctoral program in nuclear engineering. The first PhDs in ceramic engineering at NC State were awarded to William C. Hackler and Albert D. Indyk. The first PhD in chemical engineering at NC State was awarded to James K. Ferrell. The first PhDs in nuclear engineering at NC State were awarded to Robert Howell Bryan and Hervasio Guimaroes de Carvolho (arguably the first Hispanic student to receive a PhD at NC State). July 1, 1954, the Minerals Research Laboratory (MRL) became the responsibility of the School of Engineering. In 1954, the departments of Ceramic Engineering, Geological Engineering, and the Metallurgy Program in Mechanical Engineering were merged to form the Department of Mineral Industries with W.W. Austin as head. Separate degree programs were retained in ceramics, geology, and metallurgy. The first African-American undergraduate students entered NC State; all were engineering students. Walter Holmes enrolled in mechanical engineering with an aerospace option, and Irwin Holmes, Manuel Crockett and Edward Carson enrolled in electrical engineering. Irwin Holmes was the first African American to receive a bachelor’s degree from NC State (electrical engineering). The engineering mathematics degree, formerly offered through the Department of Mathematics in the School of Engineering, shifted to Physical and Mathematical Sciences (PAMS). The last mention in University Archives for that degree as being actually awarded was in the 1961 commencement program. J. Harold Lampe stepped down as Dean of Engineering after 17 years of service, the longest term for any Dean of Engineering at NC State. Ralph E. Fadum was named Dean of Engineering. During his tenure, 1962-1978, (1) the Center for Acoustical Studies, the Water Resources Research Institute, the Engineering Design Center, and the Center for Marine and Coastal Studies were established; (2) the Department of Mechanical Engineering broadened to include Aerospace Engineering; (3) the Department of Engineering Mechanics and the Department of Materials Engineering were established; and (4) the Cooperative Engineering Education Program and Engineer-in- Residence Program were initiated. A new degree was established: the Bachelor of Science in Aerospace Engineering. Long before that, NC State offered an aeronautical option within the Bachelor of Science in Mechanical Engineering degree program. The first PhDs in mechanical engineering at NC State were awarded to Ozer Ali Arnas, Charles Team Carley, Tuncer Cebeci and Franklin Delano Hart. School of Engineering enrollment (undergraduate and graduate combined) was 3,365. James K. Ferrell became head of the Department of Chemical Engineering, which he carefully nurtured to national prominence during his tenure until 1980. During Ferrell’s tenure he (1) established within the College of Engineering the Eos computer system, (2) helped organize the Triangle University Computation Center that linked NC State, Duke University, and UNC-Chapel Hill in one of the world’s largest university computing centers, (3) directed energy and environmental research programs in the College of Engineering, (4) and later served as the college’s associate dean of research and interim dean of engineering. Anna Clyde Fraker became the first woman to receive a PhD in engineering at NC State (ceramic engineering, 1967) and the first woman to receive an advanced engineering degree of any kind at NC State. Geological Engineering left the Department of Mineral Industries to become the Department of Geosciences, in what is now the College of Physical and Mathematical Sciences. The Center for Acoustical Studies was founded by Franklin D. Hart. The Department of Mineral Industries name was changed to Materials Engineering, and the distinctions between ceramics and metallurgy degrees was removed. The first PhD in industrial engineering at NC State was awarded to Manmohan Krishan Wig. The first PhD in materials engineering at NC State was awarded to Walter Jackson Lackey. Arthur Eckels was released from some of his electrical engineering teaching duties to initiate the School of Engineering’s first minority engineering effort — that of fundraising for programs to recruit minority students. The school’s first summer program for minorities, held in 1973, was funded by General Electric and Western Electric, followed by funding from DuPont in 1974. Hubert Winston became the first African American to receive a doctoral degree in chemical engineering. He also had the distinction of being the first African-American faculty member in the College of Engineering and in the Department of Chemical Engineering. School of Engineering enrollment (undergraduate and graduate combined) was 3,702. Joab L. Thomas became chancellor. Byard Houck was named Director of Special Programs and created the Minority Introduction to Engineering (MITE) summer program. MITE later merged with the Student Introduction to Engineering (SITE) program. By 1978 NC State was running the largest minority engineering summer programs in the nation after only five years of recruiting and fundraising efforts. Ralph E. Fadum stepped down as Dean of Engineering after 16 years of service, the second longest term for any Dean of Engineering at NC State. Alumnus Larry K. Monteith became Dean of Engineering and served until 1989, with the following accomplishments during his tenure: (1) Establishment of numerous interdisciplinary industry/education research centers, including the Center for Communications and Signal Processing, the Center for Engineering Application of Radioisotopes, the Center for Transportation Engineering Studies, the Center for Precision Engineering, the Applied Energy Research Laboratory, the Electric Power Research Center, and the Integrated Manufacturing Systems Engineering Institute; (2) Increased emphasis on developing graduate programs, computing facilities, television and video-based engineering education, and recruitment of minority students; (3) Development of high technology programs and acquisition of state-of-the-art equipment, such as those in the Solid-State Laboratories; Microelectronics Research Program, and Materials Research Center; (4) Development of plans for the Engineering Graduate Research Center for the new Centennial Campus; (5) Precision Engineering Center’s receipt of a $5 million grant—the largest direct research ever won by the University up to that time; (6) the Department of Mechanical and Aerospace Engineering’s receipt of a $1.7 million per year grant for a research and graduate education program in hypersonics aerodynamics. The Institute for Transportation Research and Education was established. Sarah A. Rajala joined the Electrical and Computer Engineering faculty and became the first woman PhD faculty member to join the College of Engineering. School of Engineering enrollment (undergraduate and graduate combined) was 5,406. The Center for Engineering Applications of Radioisotopes was established. The Center for Transportation Engineering Studies was established. Hans Conrad was appointed head of Materials Engineering. The Microelectronics Center for North Carolina was established (“at NC State” says University Archives). Bruce R. Poulton became chancellor. George Bland became the first African American appointed as an Assistant Dean (Undergraduate Student Services, 1982) and as an Associate Dean (Undergraduate Programs, 1985). The Integrated Manufacturing Systems Engineering Institute was established. The Applied Energy Research Laboratory was established. The Materials Research Center was established. The University received a 780-acre tract of land from the State of North Carolina, part of the Dorothea Dix Hospital property. Plans called for a “Centennial Campus” to be built as a series of clusters with a mixture of academic buildings and private research buildings. The Electric Power Research Center was established. John Hren became the department head for Materials Engineering. The first PhD in aerospace engineering at NC State was awarded to Alan Wade Wilhite. The Precision Engineering Center was established. In keeping with national trends, the Department of Materials Engineering name was changed to the Department of Materials Science and Engineering. The Engineering Undesignated (EU) program began formal operations. The School of Engineering changed its name to the College of Engineering. Administrative responsibility for the Department of Computer Science transferred from the College of Physical and Mathematical Sciences (PAMS) to the College of Engineering. Christine Grant became the first African-American woman faculty member hired in the College of Engineering and in the Department of Chemical Engineering. William (Bill) Isler became the first African American to hold the position of Assistant Dean for Research Programs (1989) and later Associate Dean for Research Programs (1991). John G. Gilligan was named Interim Dean of Engineering. NC State’s College of Engineering offered the state’s first online, real-time, Internet-based distance-education class to students at the University of North Carolina at Asheville. The class was a graduate-level course in ergonomics. Sarah A. Rajala became the first woman to be named an associate dean in the College of Engineering. She was named Associate Dean for Academic Affairs. The Silicon Wafer Engineering and Defect Science (SiWEDS) Center, an NSF Industry/University Cooperative Research Center (NSF I/UCRC) ( unofficially established in February 1996) became a formal NSF I/UCRC. Larry K. Monteith stepped down as Chancellor; Marye Anne Fox became NC State’s first woman chancellor. Kenan Center for the Utilization of Carbon Dioxide in Manufacturing was established as an official center jointly administered by NC State University and the UNC-Chapel Hill, with a special partnership with the Oak Ridge National Laboratory. Michael J. Rigsbee named head of the Department of Materials Science and Engineering. The people of North Carolina passed an educational bond issue that provided more than $468 million for the renovation and construction of almost thirty academic buildings on the NC State campus. 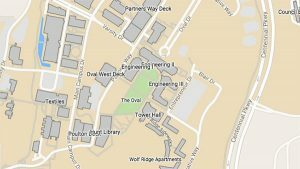 The bond referendum was a critical step in achieving the College of Engineering’s goal of relocating the entire college to Centennial Campus. Network Technology Institute (NTI) established. Formerly Multimedia Lab since March 13, 1998. NC State announces the establishment of the Networking Technology Institute (NTI), directed by Dennis Kekas. Ayman I. Hawari appointed director of the Nuclear Reactor Program. Linda D. Krute appointed director of distance education programs. NC State University was designated as a Center of Academic Excellence in Information Assurance Education by the National Security Agency; Dr. Annie Anton is involved. Yusef Fahmy named director of NC State’s Engineering programs at UNC-Asheville. Distance education in College of Engineering changed from being called Video-Based Engineering Education (VBEE) to Engineering Online. Sarah A. Rajala was named associate dean for research and graduate programs, replacing John G. Gilligan, who was named vice chancellor of research and graduate studies for the university. Formal groundbreaking for Engineering Building I took place on Centennial Campus. Richard F. Keltie was appointed associate dean of academic affairs, replacing Sarah A. Rajala, who had served as associate dean of academic affairs since August 1996. H. Troy Nagle was named interim head of the Department of Biomedical Engineering. Robert J. Trew was named head of the Department of Electrical and Computer Engineering, replacing John R. Hauser, who had served as interim head since August 16, 2001. The Industrial Extension Service (IES) celebrated the grand opening of their first county-funded extension office, which is in Williamston. The College of Engineering published the premier issue of Engineering Frontline, a publication for alumni and friends that combines news with the NC State Engineering Foundation annual report. Cyber Defense Laboratory in the Department of Computer Science opened. Joint master of science and doctor of philosophy degree programs in biomedical engineering at NC State University and UNC-Chapel Hill were approved with programs to begin in August 2003. Yahya Fathi appointed co-director of Operations Research, replacing Xiuli Chao. Teresa A. Helmlinger was inaugurated as the first woman president of the National Society of Professional Engineers (NSPE). She is also the first engineer from North Carolina to hold the office. NC State University and UNC-Chapel Hill launched a new joint graduate degree program (master of science and doctor of philosophy degree programs) in biomedical engineering (approved by Board of Governors on May 30, 2003). Groundbreaking ceremony for Engineering Building II took place on Centennial Campus. NC State and UNC-Chapel Hill opened the Triangle National Lithography Center (TNLC), a nanotechnology center, on NC State’s Centennial Campus. The College of Engineering joined forces with the College of Natural Resources to administer a BS degree in paper science and engineering, formerly a bachelor’s in pulp and paper science and technology; the new program was approved in November 2003. The College of Engineering added Craven Community College’s new Havelock campus to its list of Two-Plus-Two program partners. The new program offers a BSE with a concentration in mechanical engineering. Peter K. Kilpatrick was appointed director of the Biomanufacturing Training and Education Center (BTEC); he continued to serve as head of the Department of Chemical Engineering until he stepped down in 2007. Alan L. Tharp stepped down as department head of Computer Science; he had served as head since 1993. The College of Engineering formed an agreement with Meredith College to establish a dual degree program (three years at Meredith, two years at NC State). Richard D. Gould named interim head of the Department of Mechanical and Aerospace Engineering, replacing Mohammed Noori, who had served as head since November 1999. The Department of Chemical Engineering was renamed the Department of Chemical and Biomolecular Engineering. The Department of Chemical and Biomolecular Engineering and the Department of Materials Science and Engineering vacated Riddick Engineering Laboratories and moved to Engineering Building I on Centennial Campus. James L. Oblinger became NC State’s 13th chancellor. The Ross W. Lampe Family of Smithfield established a $1 million “Lampe Professor of Electrical and Computer Engineering. The Department of Nuclear Engineering is expected to get a research center of excellence as part of a $4.8 billion multi-institutional project to establish the Idaho National Laboratory. Two Chemical and Biomolecular Engineering faculty members were elected to the National Academy of Engineering (NAE): Carol K. Hall and Joseph M. DeSimone. The Golden LEAF Foundation awarded $5.4 million to the College of Engineering as part of the foundation’s $9.3 million Aerospace Alliance Initiative, which will help the College establish a Center of Excellence for Certification and help businesses make parts for aging military aircraft, with initial focus on Cherry Point. The Department of Industrial Engineering vacated Riddick Engineering Laboratories and moved to Daniels Hall. Biomanufacturing Training and Education Center (BTEC) groundbreaking is held. George F. List named head of the Department of Civil, Construction, and Environmental Engineering, replacing E. Downey Brill Jr., who served as head since 1988. The first floor of Engineering Building II opened just in time for fall classes. The gutting of Riddick Labs began. The renovated building will house the Physics Department and provide teaching space for the Department of Animal Science. The Engineering Graduate Research Center (EGRC) was renamed the Larry K. Monteith Engineering Research Center (MRC) in a dedication ceremony. Steve Kalland was named Executive Director of the North Carolina Solar Center. An NC State engineer helped invent a filter that removes a human form of Mad Cow Disease from blood. The Golden LEAF Foundation awarded $5.4 million to the COE as part of an Aerospace Alliance Initiative. NC State University and IBM announced a new curriculum initiative in Services Sciences, Management and Engineering (SSME). The joint endeavor involving the Colleges of Engineering and Management made NC State the first research university in the U.S. to launch a master’s-level curriculum initiative in SSME. The Edward P. Fitts Department of Industrial and Systems Engineering became NC State’s first named academic department. Engineering Building II was dedicated. Nino A. Masnari stepped down as Dean of Engineering. He served 10 years in that capacity. 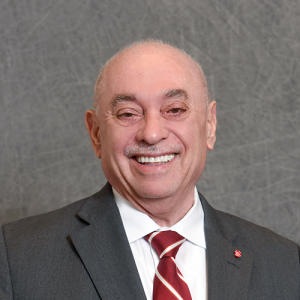 Louis A. Martin-Vega became the first Hispanic dean at NC State, boosting the College of Engineering’s rankings and research funding. Dr. John S. Strenkowski was appointed associate dean for research, replacing Sarah A. Rajala, who had served as associate dean for research since October 2002. Golden LEAF Biomanufacturing Training and Education Center opened. The Department of Computer Science and the College of Design joined forces to form Design Tech, a collaboration for research. The NSF provided funding for three years of their Research Experience for Undergraduates (REU) program to work with the project. The College of Engineering received the first US large-format Electron Beam Melting (EBM) machine. Richard D. Gould was named head of mechanical and aerospace engineering. He had served as interim head since July 2004. Paul H. Cohen was named the Edgar S. Woolard Distinguished Professor and head of the Edward P. Fitts Department of Industrial and Systems Engineering, replacing James R. Wilson, who had served as head of the department since 1999. Engineering alumnus Dr. Rajendra Pachauri shared the Nobel Peace Prize with Al Gore for environmental protection. NC State’s PULSTAR nuclear reactor produced the world’s most intense low-energy positron (antimatter electron) beam. NC State was awarded the FREEDM Systems Center, an NSF Engineering Research Center. Collaboration with the College of Veterinary Medicine produced the world’s first osseointegrated leg implant for a dog. ATEC (Advanced Transportation Energy Center) was created and given a grant by the state. Peter S. Fedkiw was named head of the chemical and biomolecular engineering, replacing Peter K. Kilpatrick, who had served as department head since January 2000. Christine Grant was named associate dean for faculty development and special initiative. The new position was created to provide support for faculty in the College of Engineering. The Operations Research Program gained a top ten ranking. The COE opened the Secure Open Systems Initiative (SOSI) on Centennial Campus, a collaborative effort to improve open-systems-related security and technology. Yousry Y. Azmy was named head of nuclear engineering, replacing Mohamed Bourham, who had served as interim department head since July 1, 2006. Richard F. Keltie was named associate dean for administration and academic planning. Jon P. Rust was named head of the textile engineering, chemistry and science (TECS). Dr. Daniel Stancil was named head of the electrical and computer engineering and Alcoa Distinguished Professor, replacing Dr. Robert Kolbas, who had served as interim department head since 2008. The Industrial Extension Service reached its goal of creating $1 billion in economic value to NC manufacturers from 2006 to 2010. Centennial Campus celebrated 25 years. The US News and World Report listed Engineering Online as the nation’s largest public online engineering graduate program. Jerome Lavelle was named associate dean for undergraduate academic affairs in the College of Engineering after serving in the position on an interim basis since 2008. Dr. Justin Schwartz was named head of the materials science and Engineering and Kobe Steel Distinguished Professor, replacing Michael Rigsbee, who has led the department since 1998. Nancy Allbritton was named head of biomedical engineering, becoming the College’s first female department head. Engineering Building III was dedicated. NC State took a leading role in federal nuclear energy hub. NC State co-hosted the NAE Grand Challenges Summit with Duke University. Red Hat donated funds to NC State to establish “The Garage,” a collaborative, open, entrepreneurial space near Centennial Campus. Dr. Randy Woodson became NC State’s 14th chancellor. Richard F. Keltie was named associate dean for research and graduate programs in the College of Engineering after serving in the position on an interim basis since 2008. Morton Barlaz was named head of civil, construction, and environmental engineering, replacing George List who had led the department since 2005. FREEDM’s smart transformers were named among world’s 10 most important emerging technologies by MIT Technology Review. The NSF FREEDM Systems Center went completely solar. Brian E. Campbell was named executive director of development and college relations at the NC State Engineering Foundation, Inc., replacing Ben Hughes who had served in the position for 18 years. A program was launched with JUST, one of Jordan’s top universities, marking the first time a US research nuclear reactor was used for education purposes outside the US. The College and University celebrated their 125th anniversary. A former NC State graduate student of ECE, Abdurrahim El-Keib, becomes interim prime minister of Libya. The NSF ASSIST Nanosystems Engineering Research Center is announced, making NC State at the time the only institution in the nation with two active NSF ERCs. Richard F. Keltie stepped down as associate dean for research and graduate programs in the College of Engineering. Dr. John Gilligan was named Senior Advisor to the Dean for Research and Graduate Programs effective January 1. The state-of-the-art James B. Hunt Jr. Library opened in January on NC State’s Centennial Campus. The 220,000-square-foot library contains NC State’s engineering collections and is a short walk from the new engineering buildings on Centennial. Dr. Carl Koch was elected to the National Academy of Engineering membership. Angelitha L. Daniel was named director of Minority Engineering Programs. Dr. Donald L. Bitzer, who helped develop the technology behind plasma-screen televisions, was inducted into the National Inventors Hall of Fame. Alice Forgety was named the new director of recruiting, enrollment management and educational partnerships in the Office of Academic Affairs. Thomas E. Cabaniss, an NC State engineering alumnus, was appointed to the University’s Board of Trustees. Dr. John Gilligan was appointed to the newly created position of executive associate dean of engineering on July 1. Dr. Tameshia Ballard was named the director of engineering education by the Office of Academic Affairs and the Department of Science, Technology, Engineering and Mathematics (STEM) Education within the colleges of Engineering and Education, respectively, on August 16. Dr. Douglas S. Reeves was appointed interim assistant dean for graduate programs in October 2013. Tom McPherson was named director of the NCSEF board. Dr. Grabow was appointed BAE Interim Head on July 1st. Dr. Laurie Williams was appointed interim head of computer science in December 15th. Dr. Peter Hauser was appointed Interim Head of TECS on December 1st. Brian Campbell was named Assistant Dean of Development and College Relations in January. Robin E. Manning replaced Thomas R. McPherson Jr. as president of the NC State Engineering Foundation, Inc.’s board of directors in January. Engineering partnered with NC Central to create a new 3-plus-2 dual degree program that was developed in March. Office of Faculty Development and Special Initiatives renamed to Office of Faculty Advancement around May. Dr. Douglas Reeves was promoted from assistant dean to associate dean of graduate programs on July 1st. Dr. Kostadin Ivanov replaced Dr. Yousry Azmy as head of nuclear engineering on August 17th. NC State and UNC Pembroke established a joint undergraduate degree program in which students will spend three years at UNC Pembroke and two years at NC State, graduating with bachelor’s degrees from both institutions. The official partnership was signed July 12th, by NC State Chancellor Dr. Randy Woodson and UNC Pembroke Chancellor Dr. Robin Gary Cummings. Phil Mintz replaced T.A. Helmlinger Ratcliff as interim executive director of industry expansion solutions on July 22nd. Dr. Marko Hakovirta was named head of forest biomaterials in August. Len Habas was named president of the NC State Engineering Foundation Board on October 27th. Dr. Garey A. Fox was named head of biological and agricultural engineering in January. Laurie Williams was named interim head of computer science. Dr. Jeff A. Joines replaced Dr. Peter Hauser as department head of textile engineering, chemistry and science on January 3rd. The University on April 20, 2018, broke ground on Fitts-Woolard Hall, which came as the result of a $25 million gift from alumni Edward P. Fitts Jr. and Edgar S. Woolard Jr. The building was formerly called Engineering Building Oval. Irwin Holmes was the first African American to receive a bachelor's degree in electrical engineering from NC State. 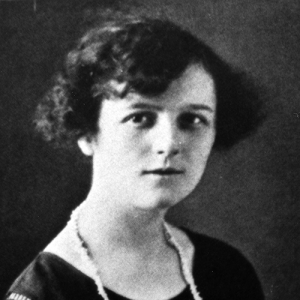 1921 – Lucille Thomson of Wilmington was the first woman to enroll as a regular student at NC State and the first woman enrolled in engineering. (She majored in electrical engineering but did not graduate.) She was described in the Alumni News as NC State‘s first co-ed and the 1,000th student to register. 1941 – Katharine Stinson became the first woman to receive an engineering degree from NC State (bachelor of mechanical engineering, aeronautical option). 1942 – Margery Belle Garriss was the first woman to receive a bachelor’s degree in architectural engineering and the second woman to receive an engineering degree. 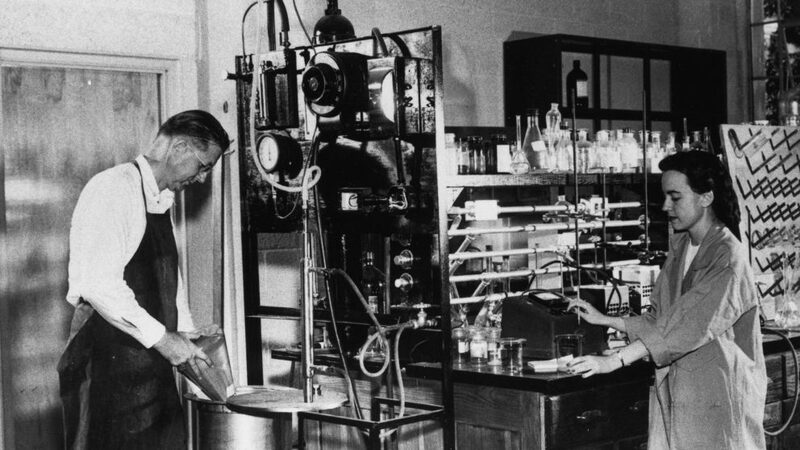 1948 – Lois Madden (Lohneiss) Todd (ChE ‘48), was the first woman to graduate with a degree in chemical engineering. She was also the third woman to receive an engineering degree from NC State. 1953 – The first African-American graduate students enrolled in NC State: Hardy Liston in mechanical engineering and Robert L. Clemons in electrical engineering. (See also 1957). 1954 – Emily Brown Blount was the first woman to receive a professional degree in civil engineering. 1956 – The first African-American undergraduate students entered NC State in 1956; all were engineering students. Walter Holmes enrolled in mechanical engineering with an aerospace option, and Irwin Holmes, Manuel Crockett, and Edward Carson enrolled in electrical engineering. 1957 – Robert L. Clemons, one of the first two African-American graduate students enrolled at NC State, became the first African-American to receive a degree from NC State; his was a professional degree in electrical engineering. 1960 – Irwin Holmes was the first African American to receive a bachelor’s degree from NC State. His degree was in electrical engineering. 1960 – Doris Lane Garcia was the first woman to receive a bachelor’s degree in industrial engineering. 1960 – Janice McLean Bireline was the first woman to receive a degree in engineering physics. 1962 – Flora Corpening Lester was the first woman to receive a degree in mechanical engineering. 1964 – Ilona Marianne Evans was the first woman to receive a degree in nuclear engineering. 1967 – Anna Clyde Fraker became the first woman to receive a doctorate in ceramic engineering. 1970 – Samiaha Mourad was the first woman to receive a PhD in nuclear engineering. 1973 – Aziza Ragai El-Lozy was the first woman to receive a PhD in materials engineering. 1973 – Samia Galal Abdel Hamid Saad was the first woman to receive a PhD degree in civil engineering. 1975 – Hubert Winston was the first African American to receive a doctoral degree in chemical engineering. He also has the distinction of being the first African-American faculty member in the College of Engineering and in the Department of Chemical Engineering. 1979 – Sarah Rajala became the first woman professor of electrical and computer engineering and the first woman PhD faculty member in the College of Engineering. 1979 – Frances M. Richardson was elected the first president of the Society of Women Engineers, North Carolina Section. 1989 – Christine Grant became the first African-American woman faculty member in the College of Engineering and in the Department of Chemical Engineering. 1993 – When Sarah Rajala was appointed director of the Center for Advanced Computing and Communication, she became the first woman in the College to serve as director of a research center. 1994 – Gregory Washington was the first African-American man to receive a PhD from the Department of Mechanical and Aerospace Engineering. 1996 – Sarah Rajala was appointed associate dean of academic affairs, making her the first woman to hold any associate dean‘s title in the College of Engineering. 1998 – Annie Antón became the first Latin American woman to join the College of Engineering faculty when she joined the Department of Computer Science. 2002 – Sarah Rajala became the first woman associate dean for research and graduate programs in the College of Engineering. 2003 – Teresa Helmlinger Ratcliff (EO ‘78) became the first woman president of the National Society of Professional Engineers (NSPE). She is the first engineer from North Carolina to hold the office. 2006 – Louis Martin-Vega became the first Hispanic dean at NC State University. 2018 – Suzanne S. Gordon becomes the first woman to serve as president of the NC State Engineering Foundation Board of Directors. 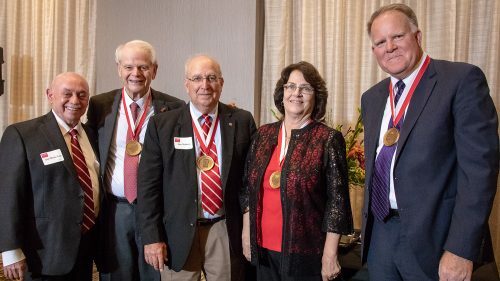 The College of Engineering at North Carolina State University bestowed the Distinguished Engineering Alumnus award on Suzanne Gordon, Peter Lehrer, Gil West, and Alan Weinberg. during a ceremony on October 31, 2018. •	Bringing, in other ways, distinction to the University through engineering achievement. These engineering graduates have received an undergraduate or graduate degree, or both, from the College of Engineering. Nominations for this prestigious award come from members of the Engineering faculty, and a vote by faculty representatives determines the recipients of the award. Announcement of the annual awards is made by the Dean of Engineering at the Awards Banquet during Alumni Weekend. The recipient is presented a bronze medallion and engraved certificate. In addition, each outstanding engineer's portrait hangs in Page Hall in a gallery dedicated to recipients of the Distinguished Engineering Alumnus Award.